A unique opportunity arose recently giving the town of Holt an option to acquire the beautiful Holt Domesday Slate created by Norfolk-based stonemason Teucer Wilson. Based on the 'Great Survey' of 1086 commissioned by King William the Conqueror as an inventory of the land and livestock contents, Teucer selected words from the Holt entry in the Domesday Book which vividly conveyed images such as '11 ploughs belonging to the men ... woodland for 60 pigs ... 6 acres of meadow' and other historic details. Teucer explains "I first had the idea of making a carving inspired by the Domesday Book when considering making a piece for an exhibition in Salthouse church. I wanted to carve an inscription that was visually abstract, a TEXTure, that also resonated in its specific setting." 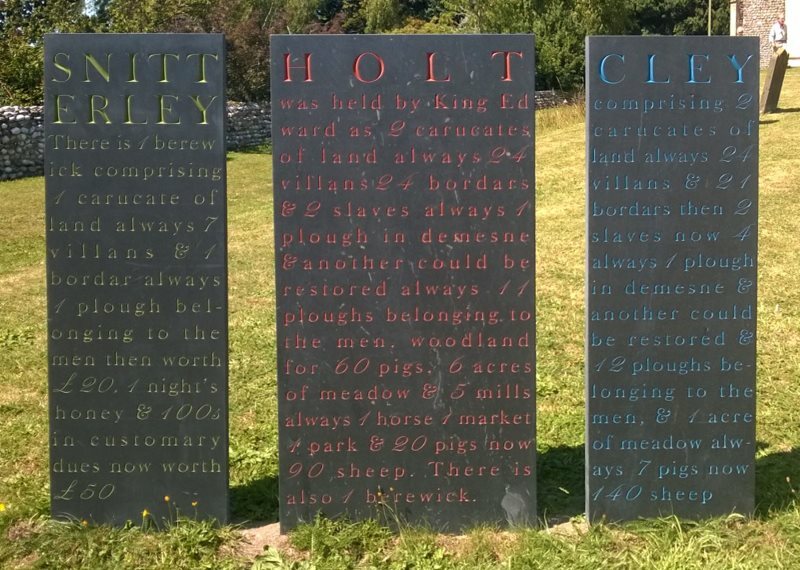 The Holt Slate originated as one of three which were exhibited in Cley churchyard in 2014. The Cley Slate was purchased by a private individual for their property and the Snitterley Slate (former name for Blakeney) was recently purchased for the village of Blakeney following a successful private donation campaign and is now installed on The Pastures for all to enjoy. 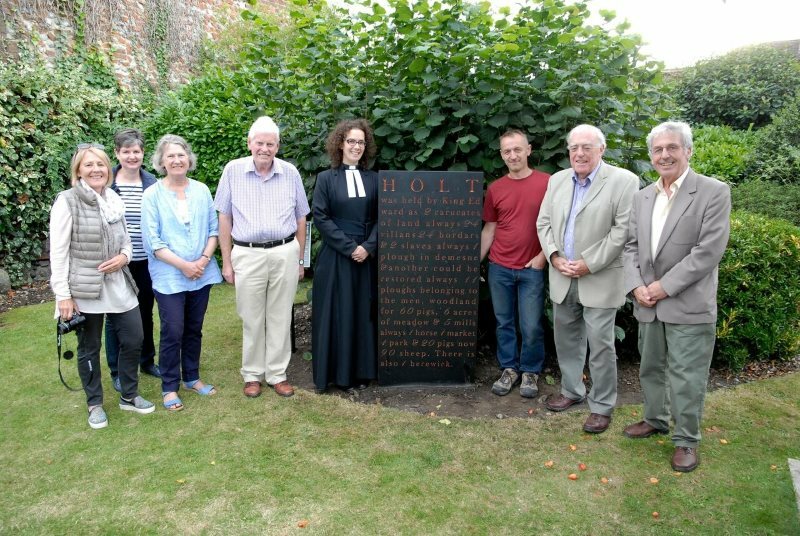 The Holt Society felt strongly that the Holt Slate should form part of the fabric and heritage of the town and thatit would also sit well with exciting new plans for an historic town trail. Following a pledge initiative from the Society a fundraising campaign was started through the membership and the Holt Chronicle. The campaign was a success and provided sufficient funds to also include a descriptive plaque. After much discussion the Memorial Gardens were chosen as the most suitable site where the Slate will sit well with the wooden bench donated by the Holt Society and Town Council. Holt Domesday Slate unveiled by Reverend Jenny Pathmarajah on Wednesday 28th September 2016 – seen here with Teucer Wilson, stone carver (right of slate) and members of the Holt Society Committee. (Photo credit: Tim Losby, Photographers Gallery).